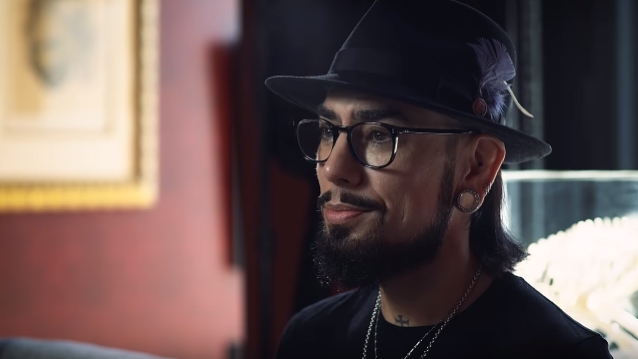 Ernie Ball's latest "String Theory" episode features JANE'S ADDICTION guitarist Dave Navarro. In the clip below, Dave discusses his beginnings with music and guitar, his love of playing and his relationship with Ernie Ball. "Guitar playing is a gift," Navarro said. "It's something I got into when I was, I think, seven years old. I was inspired by my cousin, Dan Navarro, who is a singer-songwriter. I expressed an interest in learning guitar, and he showed me some chords. And that was probably one of the most profound gifts I've ever received from anyone. Just learning three simple chords led me on a journey that forever changed my life." Dave went on to say that his taste in guitar players runs a wide spectrum. "My interests, as far as guitarists that I adore, are completely bipolar," he said. "On one end of the spectrum, I'm super into Steve Vai. I think he's one of the best guitar players to pick up the instrument. And on the other end of the spectrum, I'm into Junior Kimbrough, who's just an old, blues, just down and dirty guitar style. And I'm also interested in a lot of the English players, like Daniel Ash, Robert Smith — that approach to guitar. Kevin Shields from MY BLOODY VALENTINE is another guy." "String Theory" features a selection of Ernie Ball's most innovative and influential brand ambassadors as they talk about the sonic origins of their tone and playing styles. Other episodes have featured notable guitar players Butch Walker, Joe Bonamassa and Mike Herrera. Created and produced by Ernie Ball, the series is filmed in the home studios where artists can pick up their guitars and demonstrate skills and tricks they'e learned on their lifelong exploration of the guitar.